Nothing is more important than the safety and security of each individual. Our entire team places the highest priority on fire safety, expertly diagnosing, servicing, and repairing your fire protection system. In our Life Safety Inspections, we work to ensure complete peace of mind for you regarding your staff, tenants, clients, and visitors. Systematically working through each step of design, installation, maintenance and inspection, we go beyond trying to meet fire code regulations; we strive to keep the “worst-case scenario” from ever coming true. Every business owns multiple assets that it can’t afford to lose. These assets may be located anywhere in your building, from the front door to the back storage unit, and every room in between. Therefore, it’s important to ensure that they’re protected. Every business, regardless of the size of its footprint, depends on the equipment, tools, systems and files that drive its daily operations. After the health and safety of the people who work for you, the dependable protection of your assets should take precedence over all other concerns. Fire damage insurance claims rank in the top five of all claims with an average cost of more than $35,000 per claim. Therefore, business owners must take fire protection very seriously in order to not only meet required building and safety codes, but also to protect their building and all the assets within. Plan for your long-term asset protection by ensuring that your fire protection systems are reliable. 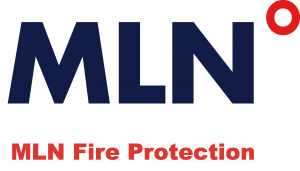 Call MLN Fire Protection Company for a full assessment or inspection today.